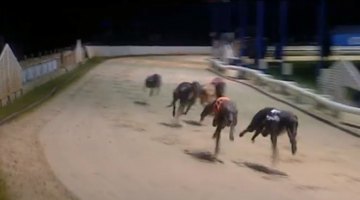 Calzaghe Flash goes into next Monday’s Local Parking Security National Sprint Final as the 10-11f, with trainer Ted Soppitt aware that he only has the dog due to a lack of trust – and a bit of luck. The Durham handler had been looking to buy another young dog with a £15K combination of cash and a bank transfer. He arrived at the service station to collect his new purchase but the Irish owner wasn’t prepared to have the dog released without full payment. End of deal. Ted said: “I was talking to Kevin, the lad who supplies my meat and he asked if I had heard about a cracking young pup owned by Seamus Leahy. He had only been trialled at Galway but looked a real prospect. “As soon as I found out the breeding, I was interested. He was by Tyrur Big Mike, who I really like out of Headford Maura who I remembered winning the Newbridge Oaks. I had a litter brother Lacken Benjy who was a real nice dog. “They told me that Flash was from a good litter and had a litter brother called Argentina. He was possibly the faster dog but Flash had the most early. When Flash arrived, I could see that he hadn’t had the guts schooled out of him. In fact, he had a problem with digestion and was a bit lean. “I guessed knew straight away that he had potential to be good, just by his behaviour. The good dogs always do everything right. I also saw Argentina run and thought, ‘if our lad can lead him up, he must be some greyhound. “Flash trialled well but his first race was a real hot puppy open at Newcastle. 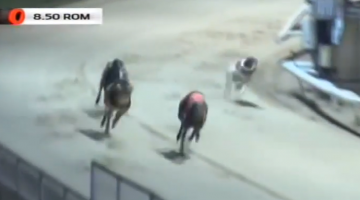 He came out behind Droopys Trapper and went past him to lead by two lengths before fading. I couldn’t believe the run against a dog of that class. “But he clearly wasn’t ready for the 480, so I decided to switch him back to sprinting. He won at Nottingham and then did a great run at Newcastle, 16.85. “I was still finding out about him and took him down to Romford for the Puppy Cup. I thought he was a middle runner but that new Romford circuit is so brilliant, that he started to rail. What a track that is now by the way! “I realised my mistake before we got to the final when he was drawn five and on the outside of the winner Grays Cup Winner. We might have got away with it on a track with a longer run to the bend, but although he led, it wasn’t by far enough to get clear. “For that reason, I took the middle seed off his for Nottingham and he is actually moving to the middle on the run-up. Fortunately he has three in the final which looks ideal. As for the dog who Ted missed out on?